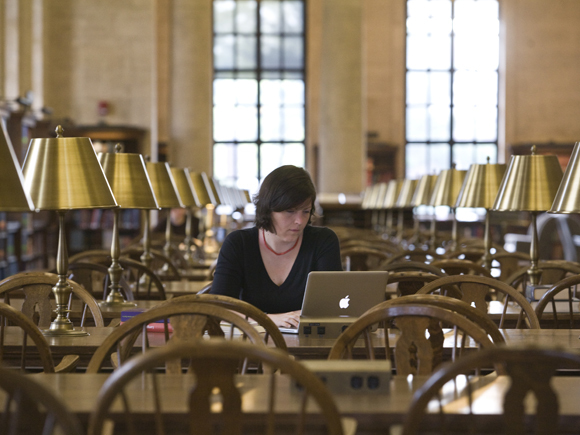 A one-year sojourn in Harvard to research medieval history: Dr. Sita Steckel in the reading room of the Widener Library, Harvard (Photo: Florian Wallenwein). Through its funding initiative "Postdoctoral Fellowships in the Humanities at Universities and Research Institutes in Germany and the USA" the Volkswagen Foundation aims to strengthen transatlantic academic relations, especially in the field of the Humanities. In this funding initiative, the Volkswagen Foundation works closely with the Andrew W. Mellon Foundation, New York. In the context of this initiative, the two foundations cooperate with several universities and research institutes of excellence in Germany, in the USA, and Canada. In general, however, applicants are able to apply to a host university or research institute of their choice. Call: Postdoctoral Fellowships in the Humanities at Universities and Research Institutions in Germany. Next application deadline is on September 11, 2018. The fellowships address postdocs based at American universities and research institutes working in the Humanities who wish to spend some time in Germany working on a research project. Details of conditions and the application procedure can be found under Information for Applicants 97 (pdf). Applications must be filed electronically via the electronic application system. Call: Postdoctoral Fellowships in the Humanities at Universities and Research Institutes in the U.S. and Canada. Next application deadline is on September 04, 2018. The fellowships address postdocs based at German universities and research institutes who wish to spend some time in the USA or in Canada working on their research project, or to concentrate on a particular aspect of their postdoctoral dissertation. Details of conditions and the application procedure can be found under Information for Applicants 96 (pdf). Applications must be filed electronically via the electronic application system. With its funding initiative entitled "Postdoctoral Fellowships in the Humanities at Universities and Research Institutes in Germany and the U.S.", which began in 2011, the Volkswagen Foundation has expanded the "Harvard-Fellowships", which started in 2007 to encompass other institutions of outstanding repute in the USA. In 2012, this fellowship program was extended by a reciprocal dimension to offer American postdocs an equivalent opportunity to spend a year working on their research project in Germany. Since 2012, the Volkswagen Foundation has closely cooperated with the Andrew W. Mellon Foundation.